We now approach Fittleworth, another favourite place for anglers, whose rendezvous must be looked for nearly a mile away near the bridge and station. The Early English church, unrestored and interesting, has in the vestry a curious stone coffin lid with a Greek cross upon it. The famous "Swan" Inn is a well-known feature of the little town and a great resort for artists, who find endless subjects in the beautiful district we are now traversing. Egdean has a church dating from the early seventeenth century. About fifty or more years ago it was "restored" in a way which even among restorers must be unique, "Early English" details being imposed upon the original work. 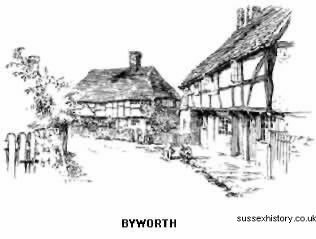 Byworth is picturesque, as Miss Vigers sketch will show; but, apart from its situation, it calls for no other comment. of more strongly marked features and greater renown.